Soon your MP3 files could be sounding even better. The Fraunhofer Institute has found a way to reproduce surround sound in a way that works with small MP3 files. Using a small amount of additional information added to an MP3 encoding stream the technology catches information about where sounds are supposed to be coming from. Fraunhofer said that the system it developed would work with existing MP3 software and music players. Surround sound is usually produced by recording audio on different channels so it appears to come from three or more directions. But more channels means more data making it a poor candidate for converting into small files that can easily be swapped online or put on a portable player. However, researchers at the Fraunhofer Institute have come up with a way to preserve this information without resorting to recording huge amounts of data. Fraunhofer reproduces surround sound by adding to MP3 encoding extra information that describes the spatial characteristics of the main audio track. Using this extra information helps MP3 players recreate the surround sound effect. Music encoded with the new system will work with older hardware and software but the extras will only the surround sound when piped through a player that can do something with the extra information. Surround sound MP3 files played on devices or by software that does not work with the system will just sound like ordinary MP3 files. The MP3 way of encoding music works by removing those parts that the human ear cannot hear. They can reduce the amount of space needed to store music on a CD by a factor of 12 without losing much sound quality. 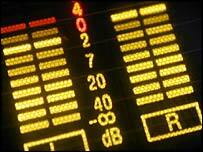 Fraunhofer said that the first products using the surround sound technology should be available by July 2004. The surround sound MP3 technology arose out of a project that the Fraunhofer Institute conducted with Agere Systems and was showcased at the Cebit technology fair in Hanover, Germany.